Brooklyn-based glass artist Anna Riley 14 GL has landed a string of grant-funded opportunities over the past year that – combined with her freelance fabrication work and teaching gigs – allow her to live in New York and advance a unique practice focused on alchemy and transparency. She frequently returns to RISD for glass-related events and recently co-presented a workshop in RISD’s Career Center on applying for fellowships and residencies. “My advice for other young artists,” says Riley, “is to take risks, apply for opportunities and try not to be deterred by rejection.” Though she now works at a cooperative studio, she still misses the extraordinary support and inspiration she found as an undergraduate at RISD. 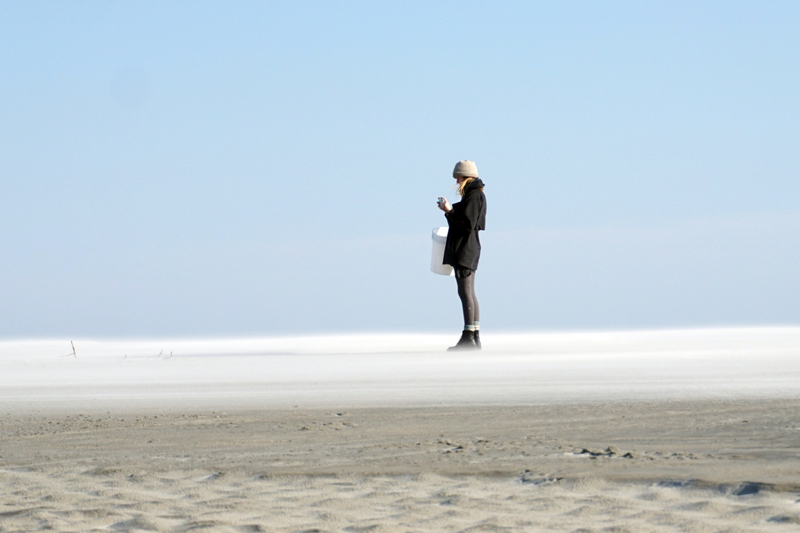 Riley collects samples on the beach during a recent Thicket Residency on the coast of Georgia. Last year Riley trekked from Georgia to Ohio to New Jersey to pursue a series of projects that intensified her obsessions with chemistry and alchemy. During a three-week Thicket Residency on the coast of Georgia, she researched the history of lime manufacture and the area’s unique “tabby” concrete, which incorporates oyster shells and sand (also key ingredients in glass). 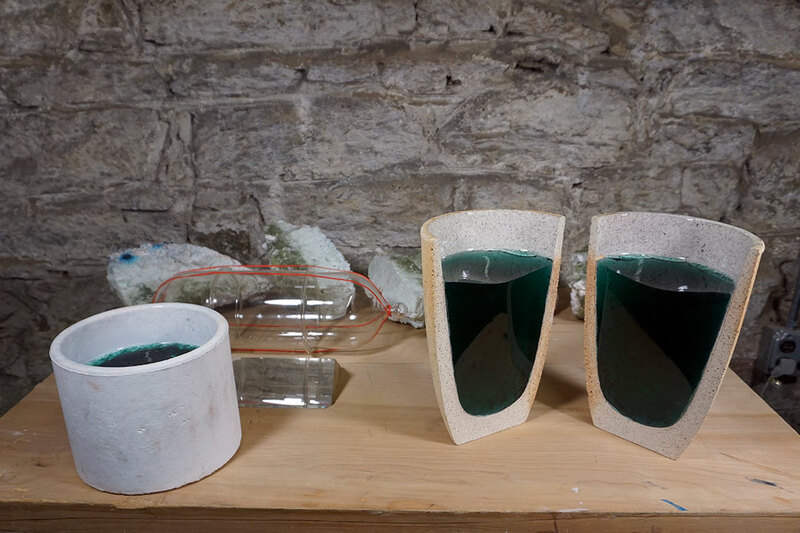 During a residency at the Wave Pool Gallery in Cincinnati, Riley created site-specific glass using raw materials harvested locally to explore the connections between maker, material and place. “At Wave Pool, you have a show midway through the residency, which pushes you to finish your project,” she notes. And at WheatonArts, which is attached to the Museum of American Glass in rural New Jersey, she conducted research on de-colorizing glass and studied handwritten formulas from American glass factories dating back to the 1800s. 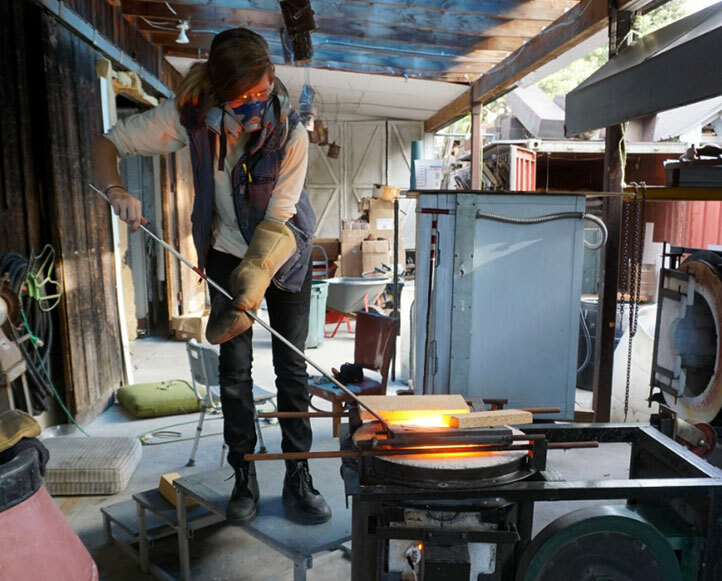 Given her predilection for history, it’s no surprise that Riley returned to RISD last November for a department-wide attempt to make gold ruby glass using a 16th-century recipe. Among the visiting experts taking part in the experiment was Glen Cook, chief scientist at the Corning Museum of Glass in upstate New York. After meeting him previously, she was once again taken by his deep understanding of the science of glass. “Interdisciplinary practices that combine art, technology and science are kind of a hot topic right now, but I’ve always used my work to try to understand science." “He’s fantastic,” says Riley. “I’ve been teaching at UrbanGlass and Brooklyn Glass since I moved to New York, and Glen and I are getting ready to co-teach a science-oriented workshop at UrbanGlass.” She’s also looking forward to a month-long residency this spring at Corning, where she’ll continue her ongoing experiments in creating colorless glass. Riley is also doing fabrication work for interdisciplinary artist Jeanine Oleson, who makes copper from copper ore. Because copper shrinks and expands at the same rate as glass, Oleson can create glass objects infused with copper without causing the glass to shatter. Glass students and faculty members team up with visiting scientists and historians to test and validate a 16th-century recipe for gold ruby glass. Cross-disciplinary designer James Carpenter 72 IL pushes the properties of glass to infuse light into his award-winning work. RISD Careers hosts a full-day entrepreneurial “boot camp” to help artists and designers interested in making a living through their creative work.